$200 million. That’s roughly the amount the US spends each day on the war in Afghanistan. But India’s ‘premier news agency’ Press Trust of India (PTI) chose to put this price tag on US President Barack Obama’s November visit to India, a claim quickly dismissed by the White House as wildly inflated. When I heard about this story, it didn’t pass the sniff test, even after applying some fuzzy math. 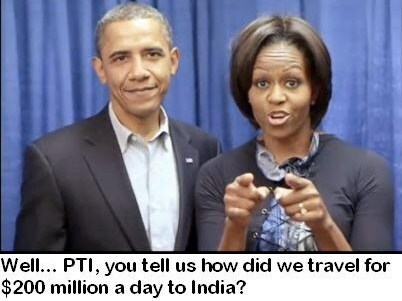 Well, on the eve of Obama’s India visit, PTI trumpeted that the US President’s trip to India will cost $200 million a day. But was there any basis in fact for the reports? I felt cheated. Even history suggests the news was false. First, the source of the news report was an unidentified Indian government official. Then the news agency also reported that the United States was sending 34 warships to protect Obama. Both the news stories were declined by the White House as greatly exaggerated. White House spokesman Tommy Vietor said, “The numbers reported in this article have no basis in reality,” and are “wildly inflated,” but “due to security concerns,” he would not offer an alternative price tag. The Pentagon also addressed the story. “I will take the liberty this time of dismissing as absolutely absurd this notion that somehow we were deploying 10 per cent of the Navy, some 34 ships and an aircraft carrier, in support of the president’s trip to Asia,” Pentagon spokesman Geoff Morrell said. A myth busting website — snopes.com — noted that even if the Indian press had correctly reported the size of the president’s entourage – 3,000 – the cost would work out to $66,000 per person per day, “a figure that stretches credulity to the breaking point.” The website factcheck.org, a project of the Annenberg Public Policy Center at the University of Pennsylvania, noted that the entire war in Afghanistan costs $190 million a day. “The claims appear to be wrong. The numbers evidently originate with the Press Trust of India, whose report was linked on the Drudge Report and picked up by Fox News host Glenn Beck. The news agency also wrongly said that the White House had blocked off the entire Taj Mahal Palace hotel for Obama’s visit and that the US was stationing 34 warships—roughly 10 per cent of the naval fleet–off the coast of Mumbai for security reasons. The agency attributed the $200 million figure to an anonymous Indian government official. It didn’t attribute the warships claim to any source,” wrote Holly Bailey on Yahoo news blog The Upshot. James Gerstenzang, a former reporter who has covered numerous foreign trips by presidents for the Los Angeles Times, actually laughed at the $200 million a day figure, which he guessed was probably inflated by a factor of 10. “It really bothers me when numbers like that get thrown around by both sides for political reasons, without it being backed up,” Gerstenzang said. Then why did the news agency file flatly false or misleading reports about Obama’s trip? And I am doubly shocked now to find PTI editor-in-chief M.K. Razdan self-patting on PTI’s role during Obama’s India visit, as his latest House Journal boasts that “President Barack Obama’s visit to India grabbed world attention. It expectedly generated huge media buzz in India…”. Certainly the visit could have grabbed the world attention for better reasons, Mr. Razdan. And by the way, how much actually did President Obama’s trip to India cost, Mr. Razdan? No, no. I won’t ask you again. You may watch this video also.